His question, and my cautious answer, “Well, I wouldn’t send you out on the streets yet”, got me thinking. How do we go from neophyte to confident urban bike rider? Or from fearful curb hugger to effective cyclist? Where do we begin? You can’t succeed in traffic if you don’t have good bike handling skills, but you can’t get enough time on the bike without at least some exposure to traffic. It’s a Virtuous Circle – the more you ride, the better you get at it. Out of this little interaction and virtuous cycle graphic came my idea for the name of this endeavor – the Virtuous Bicycle! I’ve been riding since childhood, riding among vehicles since my paper route in 5th grade. As pre-teens, my friends and I enjoyed newfound freedom ranging wide over Eastern Queens and Long Island. (A “Stand By Me” worthy memory). In my early teens, I biked each summer night to visit girlfriends in neighboring towns. Somewhat later, I rediscovered biking in my 20’s and 30’s leading trips for Country Cycling Tours, and riding international tours with my wife (8 Countries! 4 Continents!) It’s clear that a line can be drawn from my boyhood paper route, straight to here, today, where my experiences, both on and off the bike, have inevitably brought me. I’m now a League Certified Instructor, proud to display my LCI #3507. 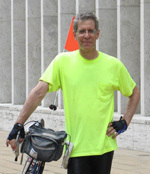 I’ve gained experience teaching as an Instructor for Bike New York – the Five Boro Bike Tour people – and find that I am an enthusiastic, even passionate instructor. I believe I have found a unique formula for safe, pleasant integration with city traffic. I promote effective, legal, and courteous roadway technique, based on responsible behavior and respect for my fellows. I do not view drivers as the enemy. They are my fellow road users and I find, when I treat them with the consideration they deserve, the respect is returned to me. I have few conflicts, no one honks at me, and I arrive home invigorated and relaxed. With the goal of encouraging this reduced-stress approach to city riding, Virtuous Bicycle will offer classes, rides, route consulting. My target are those who are already out there on their bikes, but who approach each day’s ride as though entering combat. If I can help a cyclist ride without the hostility and fear, the cycling environment improves for us all. As of this writing, I’m concurrently working to establish a social media presence, partner with local Bike Shops to offer free classes, continue work on my library of road graphics, and getting out and riding – all around the city – watching, learning, and teaching.